The Dubliner isn’t even in the field for Augusta National but as he staged a remarkable second round comeback alongside McIlroy and Zach Johnson to survive the 36-hole guillotine, he refused to push any panic buttons over the state of the Co Down man’s game. McIlroy was poor around the greens and made a double and a triple bogey in a second successive 72 to miss the cut by one stroke on four over par. That’s no big deal as far as Harrington is concerned though McIlroy clearly has a fraught relationship with PGA National having won the event in 2012, walked off after 26 holes in 2013, lost in a playoff in 2014 and then missed the cut last year. “He struck the ball well, hit the ball very nicely,” said Harrington, who admitted he was reaching for his mobile phone to book his own flight home after starting his round with a bogey and a double bogey to slip from three to six over par. “Over the years people would say Rory doesn’t like playing in the wind. Well, he looked well capable of doing it this week. The Dubliner didn’t stick his neck out for McIlroy’s putting and that was no surprise as it was mediocre. The four-time major winner racked up 30 putts as he made a double bogey five at the 15th, his sixth, and a triple bogey six at his 14th hole after failing to pull off an ambitious recovery from a water hazard. “If anything, he overplayed a couple of shots,” Harrington said, referring to the laser-like tee shot at the fifth that ended up in the hazard from where McIlroy tried an audacious recovery and ended up rebounding from the rock face into the water. Triple. Harrington was being more than kind but while he played many of the right shots himself, there were few good ones on the greens from Shane Lowry, who had 33 putts in a five over par 75 to slip 10 shots behind leader Rickie Fowler on two over par. The Clara man was on the back foot from the time he bogeyed the 10th and 11th and then three putted the 14th for a double bogey six to slip to one over for the tournament. While he recovered with birdies at the 15th and 18th, his three over par homeward nine was disappointing as he toiled with the putter and every mistake meant a dropped shot. At the other end of the leaderboard, world No 5 Fowler carded a second successive 66 to lead by a stroke from Jimmy Walker (66) on eight under par with Sergio Garcia (69) a shot further back on six over. Australian Adam Scott shot 65 to finish the day alone in fourth on five under. A bogey-par-bogey finish for a two 68 left Harrington a little deflated but having opened with a three over 73 and then soared to six over by following a bogey at the his first hole of the day with a double bogey six after a visit to water at his second, Harrington wasn’t complaining too loudly. The Dubliner spent Thursday evening on the putting green experimenting with a new set-up that ended up paying dividends. “It’s hard to believe I am disappointed,” Harrington, who holed 90 feet of putts as he birdied the 12th, 13th, 15th, 16th and 18th to turn in two under. A change in his putting set up — he decided overnight to hover his putter higher than normal — looked to be a failure after the first two holes. Then everything changed. “I missed one form four feet on the 10th and hit a decent second into 11 and ended up in the water and lipped out with the chip for par,” he said. “Then I started holing the putts I haven't been holing for ages. Graeme McDowell ground out a 69 to make the cut on level par and give himself chance of remaining inside the Top 10 in the FedEx Cup standings who qualify for next week’s WGC-Cadillac Championship at Doral. Needing a decent finish there to have any chance of making the Top 64 in the world who qualify of the WGC-Cadillac Match Play, McDowell said he was trying to block the mathematical scenarios out of his head. "It is hard to take your mind off it and I had to consciously make the decision yesterday that I wasn’t going to think about it," McDowell said. “I have plenty of golf this season if I don’t manage to get into the Match Play. It is not going to make or break my season. I like what I am doing and what I am seeing on the range and the golf course and if the good stuff gets in the way, then great. If not we will keep plugging along. “I saw what panicking does to my game last year and it is not very good. I have just got to let it happen. " Rory to miss Honda cut: "I'm pissed off"
Whether it was the hangover from the court case, the crosswinds, his lack of aggression or simply human nature, Rory McIlroy will miss the cut in the Honda Classic when the second round is completed today. Lowry cards major round at Honda: "It feels like a 62 or 63"
Shane Lowry might not win the Honda Classic but if last night’s opening 67 is a taste of what’s to come this season, he may well join that major-winning club. Rory McIlroy still on track to become world No 1 this weekend. But he must win the Honda Classic to get there. Picture by Stuart Adams, www.golftourimages.com Rory McIlroy kept his world No 1 quest on track after a gritty second round 67 left him just a stroke off the lead at the halfway stage of the Honda Classic. Bidding for a victory that would see him become the first Irishman to top the world rankings, the 22-year old battled stiff afternoon breezes at PGA National but hung tough to birdie three of his last five holes. 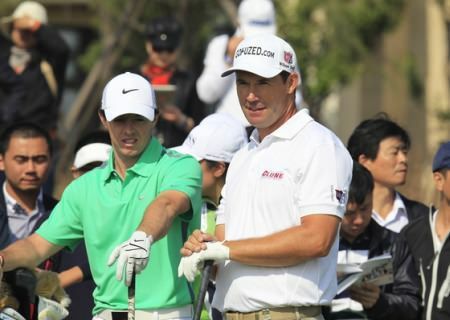 Rory McIlroy and Padraig Harrington played together in the final round of the BMW Masters. Both shot 73. Picture: Eoin Clarke/www.golffile.ieBoth showed positive signs of improvement but Rory McIlroy and Padraig Harrington still finished 10 shots behind Gonzalo Fernandez Castaño in the BMW Masters and remain outside the Top 60 who will qualify for the season-ending DP World Tour Championship in Dubai. McIlroy's Honda rewind: "I just felt like I couldn't cope with anything more"
Rory McIlroy has experienced the full gamut of emotions at the Honda Classic from the zenith of the 2012 victory that saw him become world number one to last year’s nadir — the infamous walkout that made headlines around the world. McDowell fears US Ryder Cup firepower: "I feel there is a US beating coming down the road..."